On a warm and sunny late afternoon, Olympic Sculpture Park was packed in a way I have never seen it before. The reason? Dance. The combination of sculpture and movement attracted an audience larger than either regularly draws on its own. The event brought sculptures to life with the work of five local choreographers, with audience members able to walk from piece to piece. 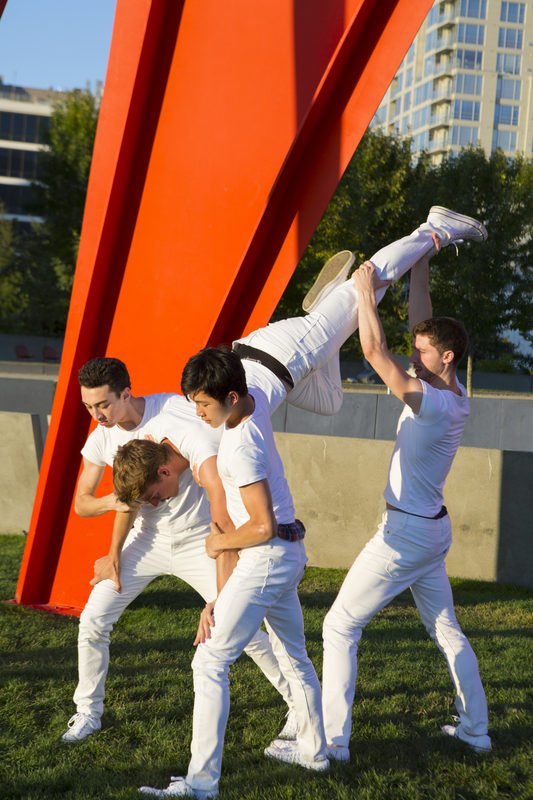 Site-specific dance has a unique set of pros and cons, and Sculptured Dance (a partnership between Pacific Northwest Ballet and Seattle Art Museum) was no exception. Without the constraints of risers and theater walls, audiences felt comfortable to voice their opinions and sometimes complaints for all to hear—treating it as a social event as much as a performance to be viewed. Audiences surround Kiyon Gaines’ Do. Not. Obstruct., danced by PNB company dancers. In contrast, the magic of outdoor dance is incredible enough to overshadow any drawbacks. 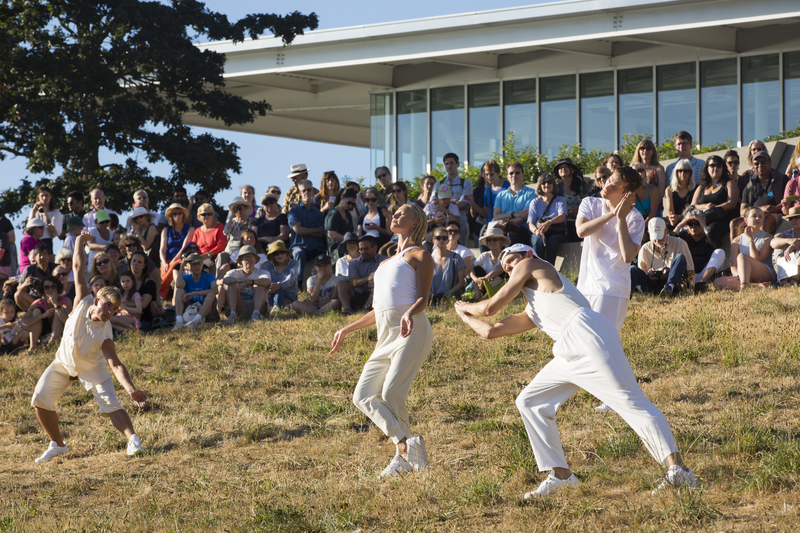 In Kate Wallich’s Little Bunnies (response to Roxy Paine’s Split), dancers performed beneath Paine’s sculpture of a tree, as a flock of birds circled above their heads and landed in the branches, as if on cue. A dog barked during a moment of quiet in Olivier Wever’s Undercurrents—as if to echo the gregarious charm of the piece’s dancers. On the walk from Undercurrents to Donald Byrd’s Untitled, a cluster of sailboats drifted by on the Sound. Each moment serendipitously matched the theme and mood of the moment in which it occurred. Little Bunnies was meditative in a way Wallich’s work often is, with Whim W’Him dancers casually walking across the East Meadow, occasionally stopping to extend a leg or enter a pose before moving along. The group movements were often subtle gestures and step-touch footwork set to music that was more or less audible depending on where you chose to stand. It was unpretentious and offhand, made for a lazy summer afternoon. The following work I attended, Do. Not. Obstruct., was ironically titled given that it was nearly impossible to find an unobstructed view. Choreographer Kiyon Gaines and performers from PNB main company rose to the challenge, however, ebbing and flowing like waves among Richard Serra’s sculpture, Wake. The choreography played particularly well to stolen glances, each shoulder roll, jog, or partner lift a treasured gift seen through a dense crowd. PNB dancers James Moore, Leta Biasucci, Leah Merchant, and Jonathan Porretta in Kiyon Gaines’ Do. Not. Obstruct. Undercurrents, set before the bold, graphic sculpture The Eagle (by Alexander Calder), was a true joy, and going by the response of the expressive audience, the favorite of the evening. From the start, four members of PNB School Professional Division came running down Moseley Path with childlike glee, arms outstretched like young boys pretending to be airplanes. They played in the grass like a group of (impeccably ballet-trained) children—marching around, lifting one another, and performing step sequences in canon, all while comically narrating their actions. Lifts were accompanied by “I’m flying!” to the enthusiastic group response of “Yeah you are!” It was light and fresh, but on a deeper level, we were able to see young dancers unserious and self-aware in a way that young dancers so often are not. At the end of the day, Sculptured Dance was hot, crowded, difficult to see, attended by some rather disgruntled guests, and a wild success. It was a delight to have so many people not only show up to a dance event in Seattle, but also to actively strain to see the performance. The audience was impressively large, and a departure from the typical crowd of dance aficionados. And while comments overheard suggested that some of the adults in attendance “didn’t get it,” every child around me was dancing, seeming to inherently understand the art before them. 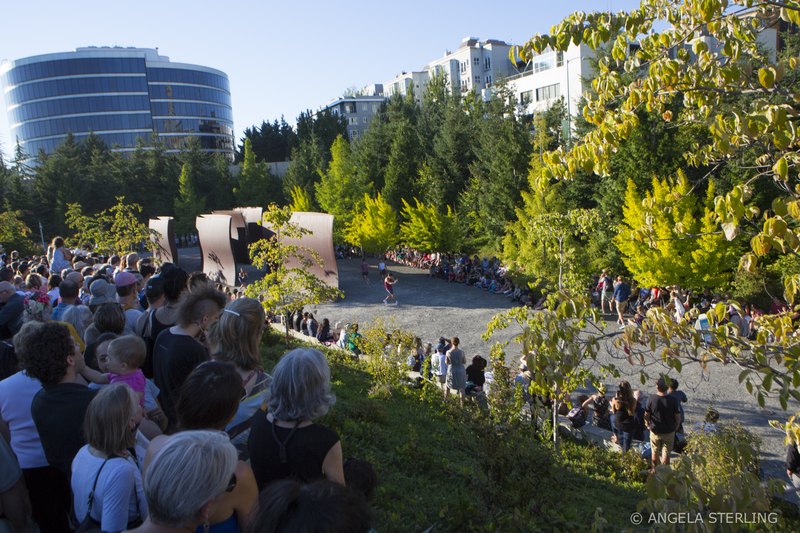 This is what made Sculptured truly great—not the high-caliber dance or the beautiful setting, but the opportunity for Seattleites from all generations and walks of life to gather and experience dance. Learn more about Kate Wallich, Whim W’Him, Pacific Northwest Ballet, Olivier Wevers, PNB School Professional Division, Donald Byrd, and Spectrum Dance Theater. Also, check out SAM and Olympic Sculpture Park here.